We are now half way through our studio research and we are loving it so far! What a pleasure to spend time the studio with dancers you admire and respect and who also happen to be really amazing people! This week we were working for half days and suddenly time seemed to fly by. We still managed to be very productive and discover some new ideas. At the start of the week our focus was on character. Last week the dancers spent a lot of time working on developing their character and thinking about how they could portray them through movement and/or text. This week we began to tackle this head on, looking at both movement and text. We soon faced an obstacle…naturalistic text! How do you put across the detail for the audience without compromising the movement or performance? Luckily, I have the pleasure of working with dramaturg Lou Cope on The Princess Alice project. Lou and I had a Skype meeting mid-week; speaking with Lou enabled me to clarify some of the key areas of the R&D. Lou was also able to offer solutions and ideas for how text is used throughout the work. As a choreographer working on researching new ideas, my head is very much in a explorative and investigative mode. Working with a dramaturg helps me to see the bigger picture. Lou often talks about the end result; how it might look, who it might involve and the impact the work could eventually have once it is fully formed. This ‘long term’ perspective is very useful and helps me to ensure that the R&D, whilst being experimental, has a clear focus. We also continued to look at the disaster itself- another area that has posed a lot of questions for us. How do you show this tragic event unfolding without being distasteful? We have decided to focus on the energy and force of water. 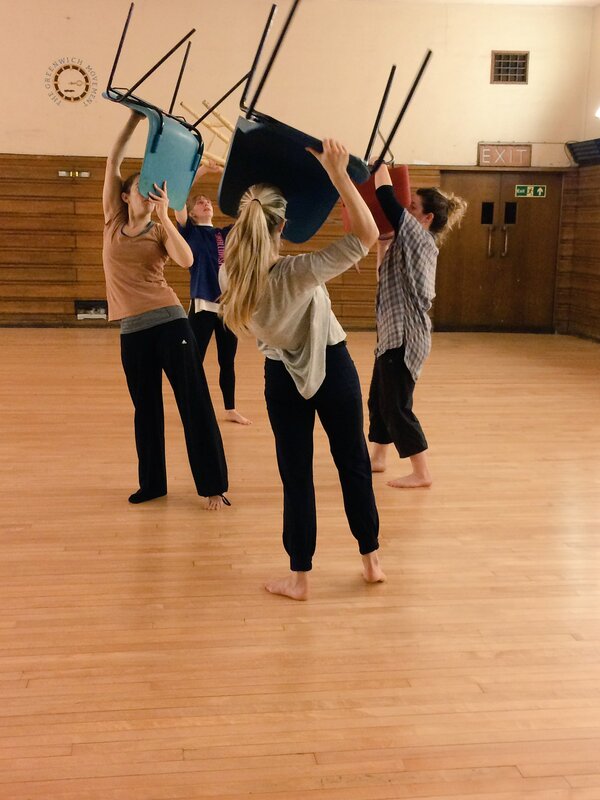 We looked at how water might move still objects such as chairs as well as developing movement with a surging energy. It is safe to say I experienced ‘choreographers block’ when working on this section. I knew the general feeling I wanted to evoke but was struggling to know how to get there…a bit like when a word is on the tip of your tongue but you just can’t get it out! Moments like that make you appreciate the team you have around you- the dancers were able to try a number of different things until I saw the moment I was having trouble articulating. Next week we will be joined in the studio by dramaturg Lou Cope for one day- so keep your eyes on our social media for updates!